At the release party for Eden, I unveiled my plan to hold a very special giveaway for the release of Jason and Lily. I wanted to do something special this time. Something amazing. Something… you know… geeky. I had a long think about what I could do, and decided to make Lily’s journal. Yes. The journal. Which happens to be Jason and Lily, for those of you who haven’t figured it out yet. I also mentioned at the party that the giveaway would be FANS ONLY, which was met with great support. The reason for this is simple: This book is special to me, and I wanted it to go to someone who would not just kinda like it. But to someone who would LOVE it. Someone who had read the stories and lived in them for a time. Someone who could connect with it. It’s possible that that someone is you. What the heck is Kate gonna make me do to get this journal??? That’s a very good question. The number one thing is, you have to prove you’re a fan. You might notice that there is a required entry option on the Rafflecopter giveaway. You have to take a quiz. It’s not hard, and you can retake it if you mess up. But you have to have read E in order to pass. Or be incredibly good at guessing. Hopefully you’ll find it somewhat amusing. Bonus entries once you’ve passed??? Oh, you know. The usual. 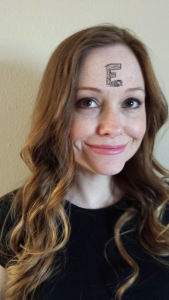 Tweet that you’re a fan, follow me on Facebook and Goodreads, post a selfie with an E on your forehead. To be fair, here’s one of me. OK, I cheated. It’s Photoshopped. But only because my husband couldn’t find the one he took of me at our first crrrrazy little release party in which it was really Sharpie. If you want, you can Photoshop yours, too! So yeah, it’s all in good fun. I’ve added lots of bonus point options to the giveaway so you can fangirl/fanboy to your heart’s content. FYI, some of the bonus point options involve posting to my blog, which I’ve installed a neat little plugin so you can all have at it! It’s new, obviously, and only tested briefly. I’m thinking it might work best if you’re not on mobile, so if you have the option, it might be better to post from a “real” computer. If you don’t see your post up within twenty-four hours and you know you haven’t written anything profane, etc, then please send me an email or contact me through the “Contact” page. I want to make sure that you all get your entries, and like I said, it’s new. 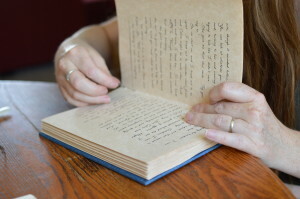 The journal in question was handmade, handbound by me, the author. It’s dimensions are approximately 9″ in height, 6″ in width, and a whopping 4″ in depth. Why is it so incredibly thick? The pages are made of high-quality parchment paper, which is a bit thicker than in a normal book. Acid-free, archival quality, and so on and so forth. 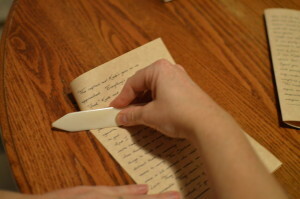 The book is printed in a handwriting-style font, which was made big enough to appear as though the whole thing was really handwritten. And that takes a lot of paper! In an effort to preserve the illusion that this is indeed Lily’s journal, there is no title page. You will only find the title on the copyright page, along with a quote, my signature, and the labeling “1 of 1”, as this is the first book in a series of one. Meaning it is the only one of its kind. 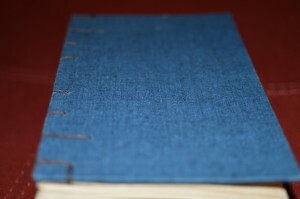 The cover is high-quality bookboard covered in mottled blue bookcloth. You might recognize it. 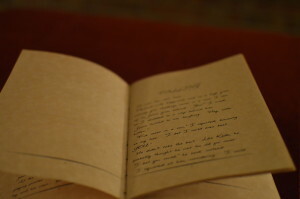 This book was used for the background photo of the official cover of Jason and Lily. It’s already famous, see. 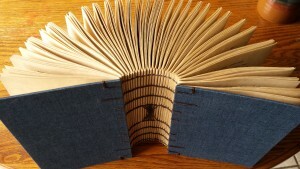 The binding was hand sewn by Yours Truly, using traditional bookbinding methods. 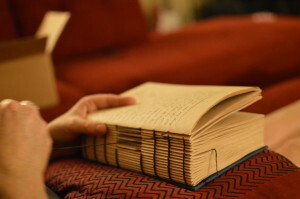 It’s called a coptic binding or perfect binding. Holes are poked, then each signature is sewn to the next one, one at a time. I also included some decorative knot work in the middle of the binding, which you might remember is how Lily’s journal was described. 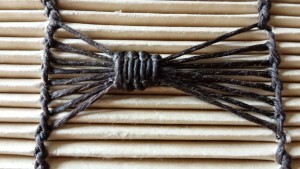 The binding was sewn with 5-cord waxed thread in brown. Forever. Oh, OK, about a week. Like a full week of my life, actively working on it. Not including writing the story, of course. How many times did you poke yourself? WHY are you giving it away instead of keeping it? Because I love you guys! I wanted to give something back. What if I haven’t read E yet and I still want to enter? Well, get on it! You have until August 8th to enter. Is the contest open to those of us outside of the US? The Prove You’re A Fan Giveaway, administered by Kate Wrath, runs from July 15-August 8, 2015. The giveaway is open to US residents only. One winner will be randomly selected via Rafflecopter. The winner will be contacted through email within one week following the end of the giveaway. The winner must provide their shipping information in order to receive the prize. 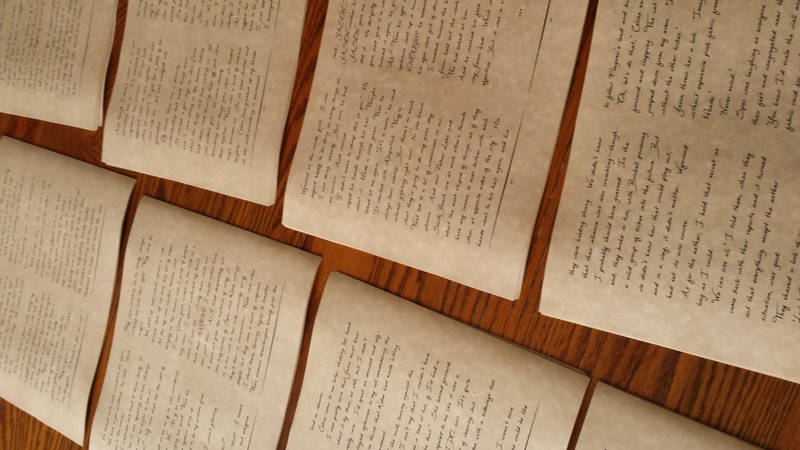 The winner will receive a one-of-a-kind handbound edition of Jason and Lily by Kate Wrath. 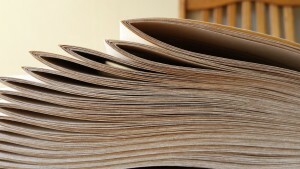 Entrants’ information will never be sold or shared, with the exception of public posts to Kate Wrath’s blog, in which the entrant will have control over the content submitted. This content will appear on Kate Wrath’s blog and will be automatically shared via social media. Limitation of Liability: Kate Wrath will in no way be held liable for the use of information, text, video, and/or photographs posted by an entrant. 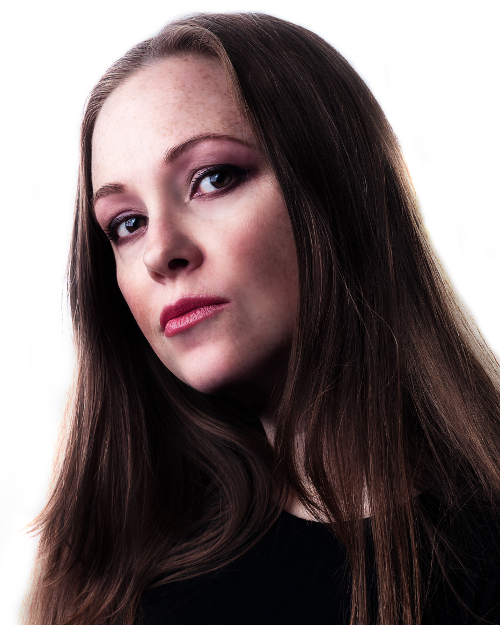 By posting content an entrant is agreeing to allow Kate Wrath to use the content publicly without restriction. The winner will be announced via Rafflecopter and on Kate Wrath’s blog at [http://www.katewrath.com/blog-blog-blog/](http://www.katewrath.com/blog-blog-blog/). NO PURCHASE NECESSARY to enter. Review copies of E are available upon request by emailing the author at kate(at)katewrath(dot)com. Uh… I made it. So, no. I am not now nor have I ever been a professional bookbinder. Its handmade quality means there are minor imperfections. But it’s pretty damned awesome, anyway. 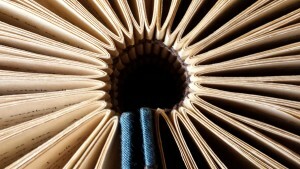 WHERE did you learn bookbinding, for crying out loud? I have an arsenal of impressive skills I keep around for times of need. *snorts coffee through her nose* No. I happen to be a forensic scientist. What will I find under my microscope if I win? Probably some tiny bits of me, minor German Shepherd fluff, and a few itty bitty sparkles of pink glitter (kids, psh). Alrighty then. If you have further questions, feel free to ask them in the comments. Now get out there and be a fan! May the biggest fan win. I want no i NEED lilys journal. This is a great giveaway.